So you’re going to Angoulême? Lucky you! I’ve exhibited with Xavier Lancel for the past several years and thought I’d share some of my favorite places to eat while at the festival. Even better, Angoulême resident Jessica Abel kindly agreed to vet my suggestions and add some of her own, and Xavier has contributed some of his insights as well! Festival Lounge – If you have a guest or exhibitor pass, you have access to a wonderful lounge. 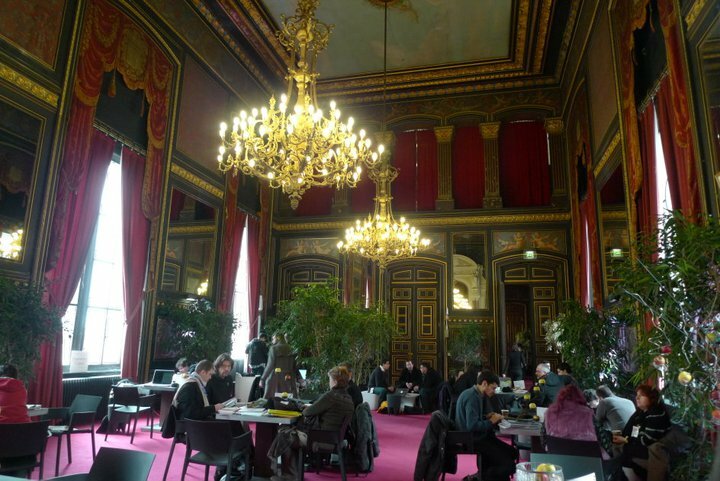 Beyond any convention green room you have EVER experienced, this opulent salon is upstairs in the Château d’Angoulême – Mairie building. Here, you can find free wifi (once you set it up with their system – ask for instructions and the password at the desk) and plugs to recharge your phone and computer. They often have complementary cognac cocktails (if you can get there early enough). They serve free water, coffee, and tea all day long. Also, they tend to put apples out everywhere in case you need a fruit fix. It’s a great place to decompress, sketch, and enjoy chatting with fellow festival guests. The lounge can be a nice place to take a casual lunch of the cheese, bread, and wine that you bought at the market (listed below). Best of all, the pros all come here and often do press conferences. I have glimpsed Riyoko Ikeda, Leiji Matsumoto, and other guests of honor here, so it pays to hang out if you want to see the famous guests. X: Extra tip: if you don’t feel like using the public toilet booths, go downstairs the festival lounge to use the cleaner private ones. Fouées! 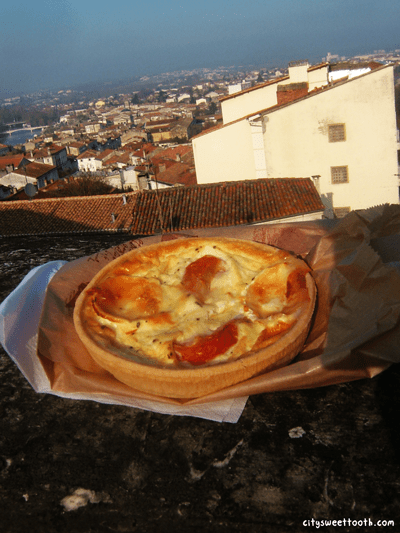 – Every time I’ve been to Angouleme, a stand for fouées would be there, steadily serving up piping hot flatbread pockets. There are several filling options, sweet or savory. I like to get it with olive tapenade. Jessica: They’re only here during holidays and festivals, unfortunately. I could eat a fouée every other day. I suggest the grillon Charentais (see below) or the chèvre (goat cheese). A good, fast, and cheap lunch. Outdoor Crepes – You can also usually find a crepe stand outside. If they’re serving hot wine too, buy it! It’s cold out, after all. Jessica: the best crepe stand in town is usually to be found near the Head of Herge, or near the museum. A classy forest-green trailer called Ty Breizh, they are actually from Bretagne (home of crepes) and it shows. Get a galette to start (buckwheat savory crepe, then follow up with a crepe with homemade caramel au beurre salée. Parfums Sucrés – Charming patisserie that also has a lovely upstairs dining area and serves lunch as well as a huge array of pastries. I always visit this place several times during the festival for snacks, lunch, and coffee. It is very convenient to the New York festival tent and just a delight! I tend to buy a lot of canelés there. It can get busy for lunchtime, but if you go for a late lunch you can get seated fairly easily. 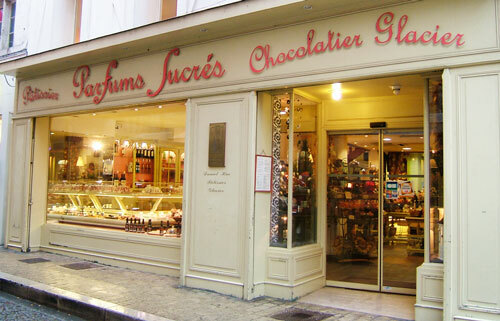 Duceau Chocolatier – The place to get all kinds of lovely chocolates as souvenirs (if you can stop yourself from eating them first)! making you choose a piece of galette and eating it, hoping to find inside a feve (little toy), meaning you are then named king or queen. French people usually do this on the first days of January, but nobody will look weird at you if you do it so late. Les Halles Market (aka “le marché central”)- Angouleme’s big, glass enclosed, food market is right in the festival area, and if you can get there in the morning (it closes at 1pm) it’s a great spot to shop for cheeses, yogurt, and all kinds of other delicacies. Last year, I noticed they added a little coffee bar, Le Bistrot Bachelier, that had some nice breakfast sweets and seating. I enjoyed getting daily morning coffees and sweets there. It seems like a place that locals go to all the time. Jessica: I second the recommendation of Le Bistrot Bachelier. It’s just as you enter the front door on the left. All food there is homemade by Mme Bachelier, and they are DUCK FARMERS. So their daily specials are two or three fabulous preparations of duck. All good, all of it. And a good deal, too. Excellent wines by the glass, excellent homemade cakes and desserts. They also have fresh oysters. Another local specialty. This place is don’t-miss. But note: get there by 12:30. Lunch only, except Fridays, when the market is open until 6 (usually). Also at les Halles: two amazing cheese vendors, both with many local chèvres (goat cheese) worth trying. See note at bottom re: local specialties. Elsewhere in the market, you can get all kinds of patés (including duck rilletes with foie gras en croute at Bachelier, my personal fave), saucissions secs (salami), excellent cheeses, and lots of nice fruit. Come with your own napkin and a penknife, and you can feed yourself like a king sitting outside on a bench. Biscuiterie Lolmède – A biscuiterie, as the name implies, specializes in cookies. Lolmède specializes in “macarons à la ancienne” i.e. old-skool macaroons. Which means they look like little almondy/flavored gumdrop cookies and are not filled. A special treat. My fave there is actually the chocolate-dipped madeleines. You can get tea, coffee, and very good hot chocolate in the pleasant café to accompany your cookies. Also, if you need to get gifts for friends at home who are not comics fans (is there such a thing?) this is a great place to go. 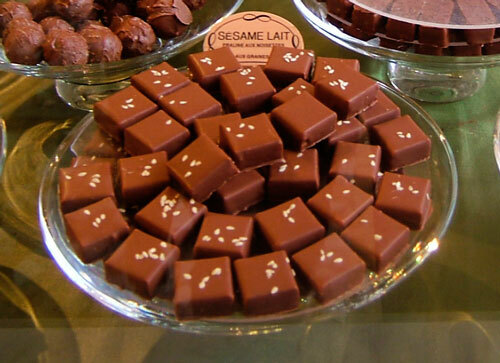 They’ve got all kinds of regional specialties, lovely chocolates, gift boxes of macaroons, cognac, you name it. 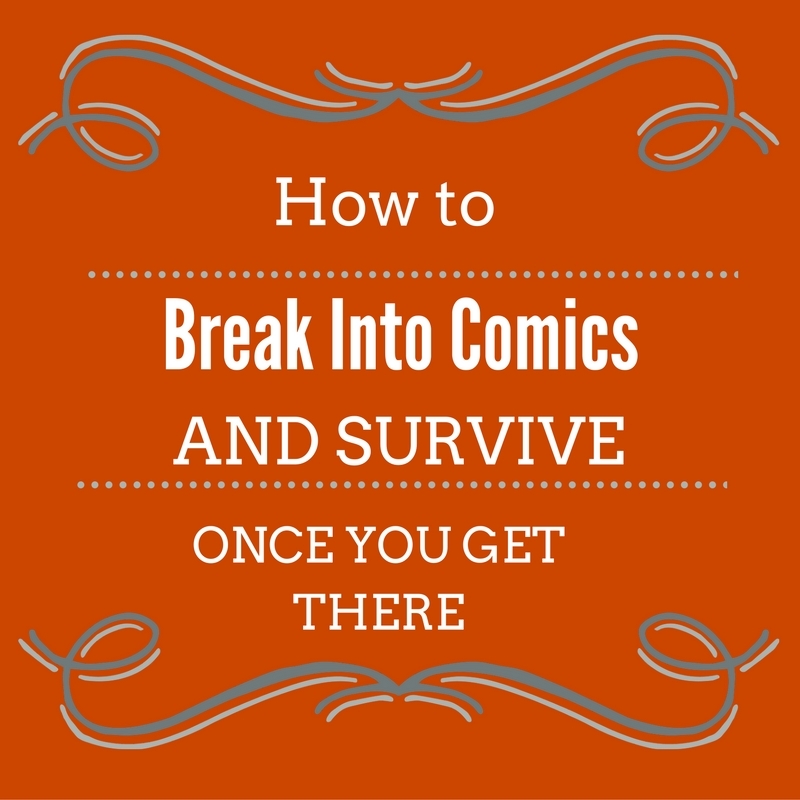 The owners are very comics friendly and always do something special for the festival, too. X: Extra tip: Buy your food at the market and rendez-vous to the festival lounge where you’ll be able to seat and eat. French people like to socialize around food and drinks so this could be the perfect occasion to make friends. Crèpes Par Faim – Cute crepe restaurant. A good place for a gallette and cider lunch! Jessica: Agreed! I love these crepes. My fave is the one with coulis de tomates, which I request with chèvre. La Calandrine – Do you like cheese? Melted cheese? Then, this is a can’t miss stop. 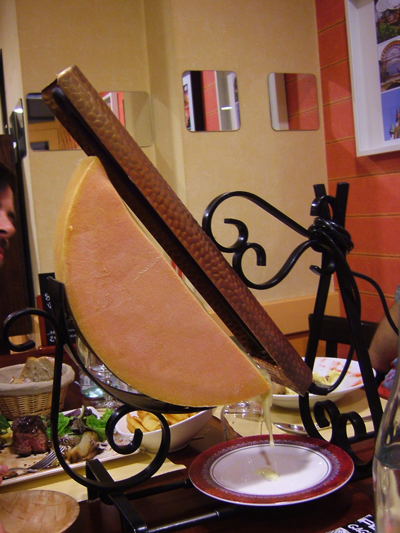 They have fondue and pizzas, but the thing to get is raclette, ask for the huge wedge of cheese attached to a heater, it will slowly melt as you scrape it down onto (unlimited?) plates of salad, charcuterie, and a bucket of yummy little potatoes that come with the cheese. This is more of a group activity (for at least two people), but it is a one-of a kind experience! Dinner can get crowded, so I’d recommend making a reservation, but if you can get there for lunch, it shouldn’t be tough to get a table. Also, prepare to smell like cheese afterward, but you’re in France, so live it up! Jessica: I’m actually a big fondue fan from way back (and a pizza snob) and can’t really recommend La Calandrine. Their pizza is very…French. 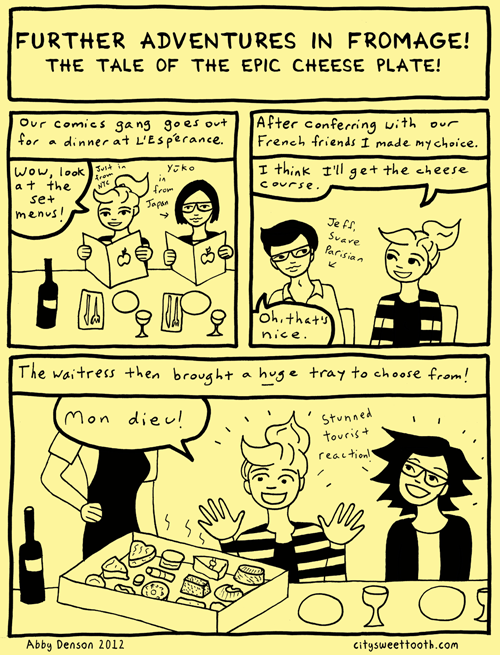 And their fondue (which is a Swiss dish) is also…French. Not flavorful enough for me. I’ve actually never tried their raclette, and probably should. I’m betting that’s way better than the rest of the menu. Melting raclette cheese on boiled potatoes is hard to mess up. That said, I’ve eaten there many times, and can guarantee you will emerge having eaten a meal. Restaurant L’Espérance – A restaurant that the wonderful Xavier Lancel (without him I’d have never made it to Angouleme) took us to. Please stop and visit him at Scarce booth! It is not central to the festival area, but the cheese course selection there was so impressive, I nearly fainted from excitement! Jessica: wow, I have never even heard of this place! I will have to check it out. It’s way off the beaten track…this might be a good one to try when you find yourself at the museum, but it’s a hike from the main tents. Chez Paul is a really large place with food that’s nothing spectacular, but good. More importantly, it’s big enough that you might get a table on Saturday night, and it’s one of the few places open on Sunday night if you’re still in town. Jardin de Kashmir is a decent Indian restaurant, and they have (relatively) a lot of space. Can be a good option if you’re trying to get in with a group. Order a tasting menu for the full experience. Excellent French food with a Portuguese touch at times. 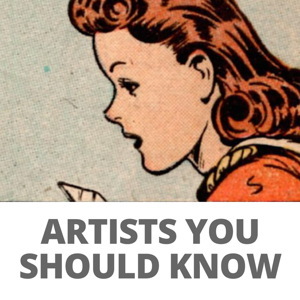 The best music and atmosphere–comics, experimental lit, and vintage soul are the decor. Jeff, the proprietor, is part of the experience–very nice guy, occasionally touchy, but will always chuck your tableware at you cheerfully. This is the kind of place where you can get an appetizer of 6 different, wonderful, local goat cheeses, or order the “fromages qui puent” i.e. stinky cheeses. Order the aubergine entree–magnifique. But everything is good. Famous for no kids-no frites rule and sometimes grouchy owner, this is a consistently excellent restaurant kind of halfway between La Ruelle and Le Passe-Muraille in elegance and price. Café Chaud – A cozy local bar and hangout. They have a funny, grumpy looking cat, engage him at your own risk! X: Extra Tip: This is the only “official” gay-friendly place in Angouleme. Bock n’ Roll has low prices and a large selection. Angoulême is the biggest town in Charente, which is a department (kind of like a county), which is one of four in the région (kind of like a state) of Poitou-Charentes. Poitou-Charente, and most of the south-west, is the bread basket of France. Lots of the nicest fruits and veg come from here. It’s also the poorest region in France, and doesn’t have a lot of internationally-known specialties, with the exception, of course, of cognac, which comes from very nearby here. But that doesn’t mean there isn’t great local fare here. Anything labeled as “Charentais” means it’s a local item, so you can look for that. Some of the best bread in France is found here. Forget those crispy Paris-style baguettes (as nice as they are), here we have crusty, chewy, serious white bread, and some very delicious whole-grain ones as well. Make a stop at Boulangerie des Halles (best in town) just across from Le Chat Noir, and ask for a baguette des Halles (chewy white baguette) or pain bûcheron (whole grain). You can also get all the basic pastries, good of course, but they are nothing to write home about, not like the bread. Cheese: this region is known for chèvre (goat cheese) of all kinds (as well as, to a lesser extent, brébis – sheeps-milk cheese). 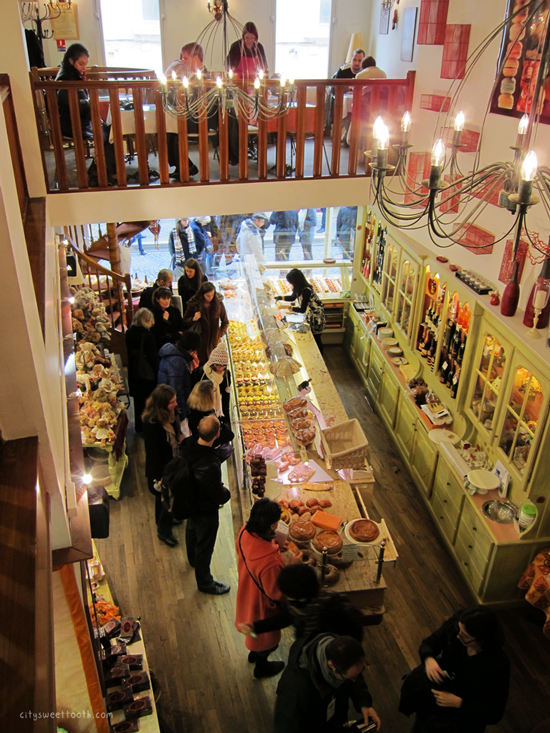 You can find like 20 chèvres in les Halles at the two excellent cheese vendors. Look for ones rolled in cinders (grayish), fresh and firm ones (frais), more aged and firm ones (affines), soft and creamy (moelleux), or eat-with-a-spoon (cremeux). 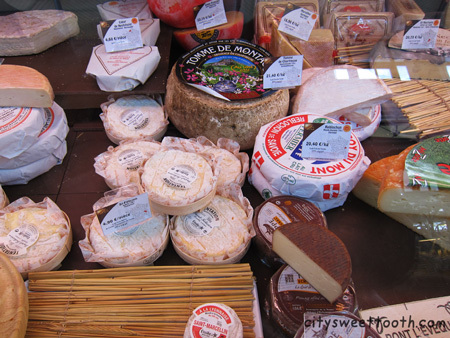 Some we’ve tried and loved: St Clement, Le Gatinois, Banon, La Pigouille (a brébis). Grillon Charantais is a local pate-like dish that’s kind of the french equivalent of carnitas, but eaten cold, by itself or on bread. You can get this in any boucherie. It’s essentially pork muscle meat (no organs) cooked down to a soft pate texture, and much of the fat skimmed off. Then it’s pressed into a mold and you buy a slice like that. Great for a cold lunch. Eat on bread with cornichon pickles, should you have any. Duck is technically a specialty of the Dordogne, but the zone really covers all of the southwest. Magret de canard (duck breast), confit de canard, magret fume (a coldcut of smoked dried duck breast), rilletes de canard (like grillon but duck)…it’s all great. You will find duck everywhere, and it’s almost always a god bet. See Chez Bachelier in the marché central for a key selection at top quality. Charente proper is not on the ocean, but Poitou-Charente includes Charente Maritime, and some of the best oysters in Europe. You can get them in many restaurants, and quite cheaply in the market at Bachelier (I’m assuming you don’t want to buy an oyster knife and shuck your own in a park–bit cold for that in January). If you like raw oysters, it’s one of the best bargains in France. We are also very close to Bordeaux, and their famous wine country. Lots of great deals on Bordeaux around here, but don’t miss local organic Charantais wines if you get the chance, such as Plantier des Chipres (you can order this as le Passe-Muraille). Le menu vs la carte – “le menu” is a set-price meal, most commonly found for lunch, but sometimes for dinner as well. There may be just one option or several, and you may be able to choose between just the plat (main dish), entree + plat (appetizer + main dish), plat + dessert, or entree + plat + dessert. There may be a beverage included. It should all be delineated on “la carte”, which is what we Americans call the menu. If you want to see the menu, ask for “la carte.” If you ask for “le menu”, you won’t get a menu, you’ll instead be asked verbally which of the two or three choices on the prix fixe menu you want, (or if it’s night possibly told that there is no menu, which will be confusing). Entrée means appetizer – When trying to decipher the menu, note that in French “entrée” means appetizer. Wine, not water – On my first trip to France, I was surprised that typically, ordering water at restaurants would be more expensive than ordering a glass of wine. So, check the menu prices and order a glass of wine if you’re on a budget. Also, when ordering water, there are often many choices (still, sparkling, mineral, etc.) if you want tap water, make sure to specify it, ask for a “carafe d’eau”. Jessica: While it’s not true everywhere in France, in Angoulême, you’ll typically get a carafe of tap water on your table automatically, and if you don’t, you can ask for “un carafe d’eau”. If you order “une bouteille d’eau”, you will be understood as wanting bottled water. Then you’ll be asked “plat ou petillant?” flat or bubbly. You can also usually order wine by the glass “un verre de rouge (blanc/rosé)” or a 25 or 50 cl carafe of house plonk, which is usually cheap and decent. Buying lozenges – Festivals can wear the throat out, I had a hard time finding lozenges until I learned to ask for “Sucrets”. The lozenge brand Strepcils is good too. Buying Toiletries – Pharmacies typically have a neon green cross sign to identify them, but they can be quite expensive. When looking for items like lotion, shampoo, or conditioner, a grocery store is cheaper. Restroom – The best indoor restroom for the festival (nea the New York tent) is in the Theatre building downstairs. Reservations – Like for any other comic events, it’s always best to get reservations if you are doing a group dinner. X: Shopping: At the end of January, in France, this will be sales season, which means the perfect time to buy things at a very affordable price. There is a huge, modern shopping mall below Le Champ de Mars, if you can’t find what you’re looking for on the pedestrian streets. Le Moulin des Halles is THE BEST bakery in all of Angoulême (I lived there for a year). It is also a good option for meals because you can get delicious sandwiches there on fresh baguettes for about 4 euros. I recommend the ham, cheese and butter sandwich. I had one of those every other day. A good vegetarian choice is the three cheese with mixed greens sandwich. If you like junk food, you can also try the “1 meter Pizza contest” at the Napoli Centro restaurant. If you can finish that huge pizza (about 5 times a normal pizza), it’s free. And that’s not all! During the festival dates, there is also a special 1€ day ticket (ticket BD) that’s valid on all the bus lines in the area, and that you can purchase from the bus driver (see on the right: http://www.stga.fr/tickets). Might come in handy depending on where you’re staying, see the route map here: http://www.stga.fr/sites/default/files/communication/plans/2013-2014/STGAabri13.pdf (I recommend downloading, it’s a large file and takes a while to load online). The buses run often on weekdays and Saturdays, the downside seems to be that all the lines stop running at about 8 in the evening. For Sundays, there are special Sunday and holiday lines (see the smaller map on the lower right of the big one) that run once an hour. Thanks for pointing out where to get a raclette in Angouleme! There are a multitude of sandwich shops along the main drag between the Champ de Mar and the New York tents and the baguette sandwiches are all amazingly flavorful, cheap (3-4 euros), and convenient. The Sicilian serves excellent Italian dishes and is just a few doors down from the Jardin de Kashmir. Stuart: I would avoid like the plague the sandwich places you mentionned beetween the 2 tents! It’s bakery at his lowest. It’s cheap yes, but cheap in flavor too! 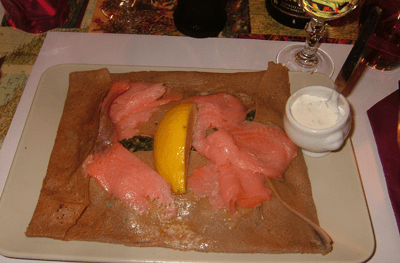 I’ve had several very agreeable meals at ‘La Tour De Valois’ on 7 Rue Massillon. In fairness I’ve had one indifferent one too, but the wine list was always excellent and the place has a great ambiance. I think it changed hands a few years ago, so I’d like to know if it’s as good as it was.